Note: This article serves as both a review and an editorial discussion on the concept as a whole. The Episode VII title discussion is below the pictured text. The Star Wars franchise has been adapted into just about every medium, parody, and homage that one could imagine over the past couple of decades. However, perhaps the most obvious possibility has not been realized until just recently. 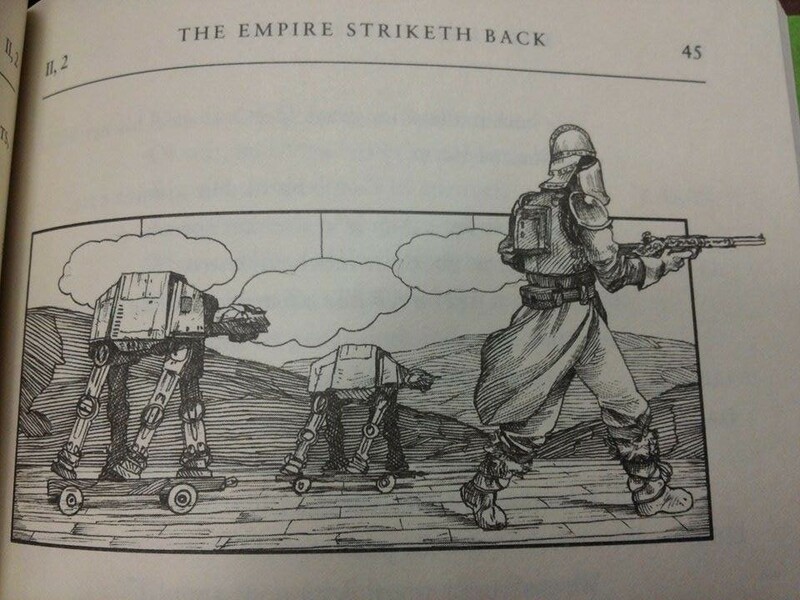 Author Ian Doescher, a self-proclaimed Star Wars geek and all-around English fan, took the premise and script of each original film, and turned them into stage plays written in iambic pentameter – as if from The Bard himself. The covers alone should alert readers as to what they are getting themselves into: stylized illustrations combining the Star Wars aesthetic with old-fashioned theater, dedicated wordplay, and an overall love-letter to both William Shakespeare and Lucas’ brainchild. Doescher explains in the afterword of Part the Fourth: Verily, A New Hope, that he studied Joseph Campbell’s beloved The Hero with a Thousand Faces, only to discover that many of the world’s most famous tales follow certain structures and contain specific character archetypes (parent/child relationships, mentor/student relationships, easily identifiable villains, etc). These similarities certainly appear throughout Shakespeare’s woks, and a certain George Lucas took notice when revising his original Star Wars script before shooting. Therefore, the narrative structure and characters of the original trilogy naturally lent themselves to a Shakespearean overhaul. Since golden letters can’t scroll through space in a book (or in a play), a familiar trope: the Chorus, steps in to regale audiences with the story’s action in rhyming fashion. Besides replacing the iconic golden scroll, the Chorus describes lightsaber duels, scenic changes, and space battles. The charm of the Shakespearean style are not lost, nor do they grow repetitive when characters speak. 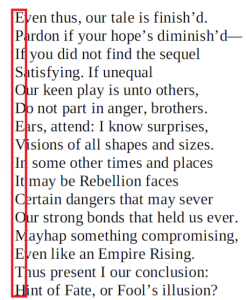 More often than not, lines are written in the classic iambic pentameter, creating a smooth flow of word-beats. Of course, from time to time, this concept is played with in other ways that pay homage to Shakespeare. For instance, dialogue between Han Solo and Princess Leia begins to resemble the exchanges between Romeo and Juliet in Part the Fifth: The Empire Striketh Back. Boba Fett, the fan-favorite bounty hunter, speaks in prose, evoking the notion of a lower class or station, indicative of his place in the criminal underworld. R2D2 and C3PO work in a comparable way to Hamlet‘s Rosencrantz and Guildenstern, often playing the fools who comment on the action. In fact, R2 speaks with phonetic beeps and whistles, tricking the other characters into thinking he is merely a simple droid. However, he makes his own asides to the audience, and sometimes even monologues, revealing his true intelligence and snarky witticism. The pages are riddled with stage directions and line numbers, ensuring that readers (and maybe one day, theater companies) are never lost. Throughout the books, illustrations by Nicolas Delort depict famous images from the series with a “what-if” theme of them happening on stage. These are both very reminiscent of their film counterparts and a great joy to behold. They walk on snow, but roll on stage. The fun Star Wars celebration does not simply stop after the above-mentioned factoids. Doescher cleverly works fan commentary, character motivations, and knowledge of the fictional universe into the plays in ways the originals could not have done when they were originally released. For example, planets such as Coruscant and Naboo are mentioned repeatedly. Long monologues, such as the one Obi-Wan gives shortly before dying, provide readers (viewers?) with expressed motivations as to why he would raise his saber, smile, and accept death, in a way that was perhaps too fast for movie-viewers (and Luke) to immediately understand. 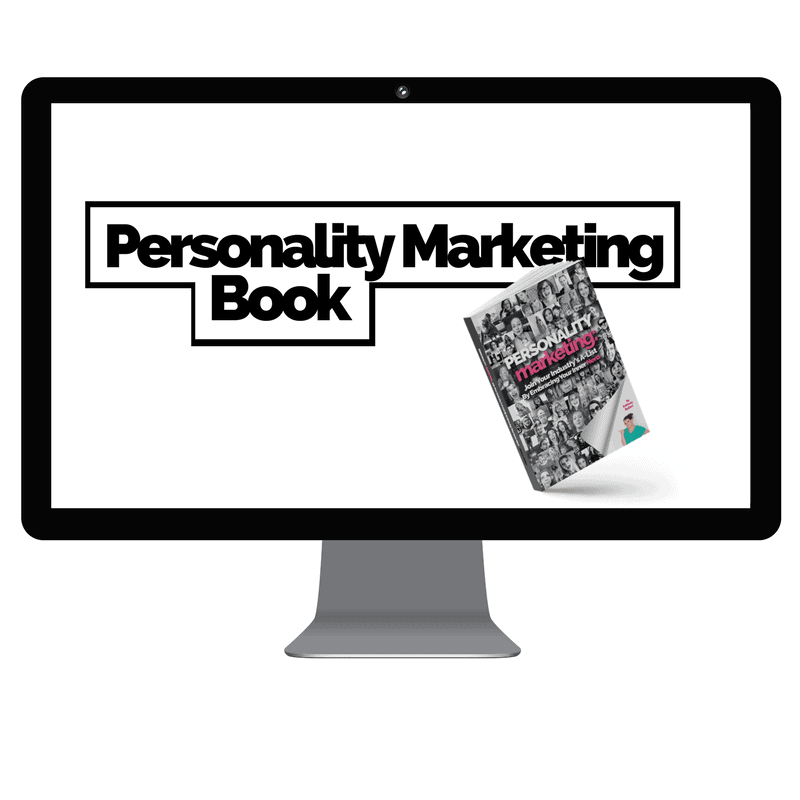 Clever commentary is sprinkled throughout, acknowledging debates and criticisms that have since arisen. When exiting the scene of the Mos Eisley cantina, Han remarks, “I pray thee, sir, forgive me for the mess/And whether I shot first, I’ll not confess.” Cleverly, the last line of the first two volumes contain word variations that hint toward the titles of the next installment. Of course, the titles of Episodes V and VI are hardly surprises. 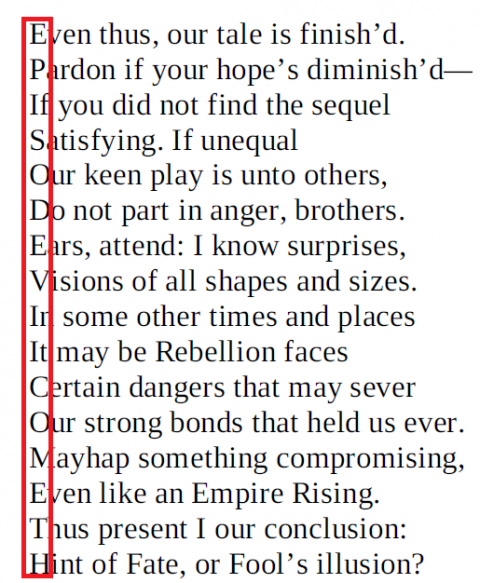 However, in the afterward of Part the Sixth: The Jedi Doth Return, Doescher indicates that a similar Easter Egg is hidden in its closing lines. 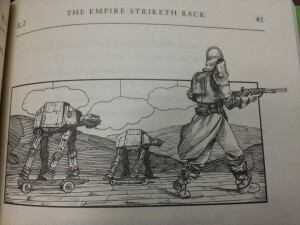 Lucasfilm sanctioned the creation of these books – perhaps its workers made Doescher privy to a certain Episode VII’s title. If the tradition of Parts IV and V closing with the next installment’s name is kept in Part VI, the title may very well be hidden in Doescher’s latest release. Obviously, “Empire Rising” is capitalized, making that phrase a clear contender. However, the Star Wars trilogies have always followed a certain pattern with their titles. The first installment is always named for an obscure concept or idea: The Phantom Menace and A New Hope. The middle release is always named for an entity carrying out an action: Attack of the Clones and The Empire Strikes Back. Lastly, the final film of each trilogy is named for a group or individual making a comeback: Revenge of the Sith and Return of the Jedi. Now, if Disney and J.J. Abrams plan to continue this style, the title of Episode VII should naturally be named for an abstract concept or idea. Therefore, “Empire Rising” sounds a little too concrete to meet that criteria – more along the lines of Episodes II and V. So, our attention should now be drawn to the last line. The two phrases separated by the comma both meet the standard of alluding to something tangible, yet unknown. So, could Episode VII end up being called A Hint of Fate or A Fool’s Illusion? These possibilities certainly fall in line with the titles of Episode I and IV. In fact, just like Episodes I and IV, these titles would be relatively unique as far as movies are concerned. After all, despite Episode I’s quality or lack thereof, The Phantom Menace is admittedly a cool and distinguishing title. If I shall write the prequels next or not. But whether folks would read them: a long shot? Like something people may not want to read. For how would one translate old Jar Jar Binks? Was to write all the prequels in one book. While other, worser parts I’d overlook. But still the thought roams ’bout within my pate. Ultimately, these books are great fun. I read them by myself, and that was quite enjoyable. However, I can only imagine that reading parties with friends would be an even bigger hoot.